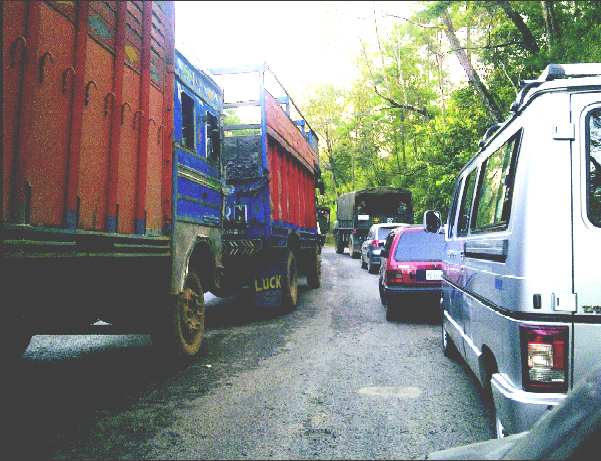 Umiam/Shillong: Thousands of trucks and other vehicles were caught in yet another traffic jam that started from Mawiong up to Sumer. The traffic snarl lasted the whole day and according to travellers stranded on the road, it began since Friday night. The Tura night bus that usually reaches Shillong by 6 am was stranded with passengers and reached Shillong only at 4 pm. They had to go for nature’s call in the nearby forests and many were hungry. Children and babies were worst afflicted. That’s for the upcoming traffic. From Sumer downwards, trucks bound for Guwahati also stopped by the road side because a trailer carrying eight Maruti cars turned turtle right in the middle of the road in Umsning near the tea garden. Traffic bound for Shillong were held up because a truck had broken down in the middle of the Umiam bridge near the dam. Traffic jams on GS Road have become a common sight. Citizens and visitors are held to ransom on these roads. Different leading institutions in the State including NEIGRIHMS, IIM Shillong and others have regular visitors. Most of them reportedly think twice now about attending a conference in Shillong. Recently Dr Chandran Gyanamuthu, a neuro-psychiatrist who attended a conference at the Martin Luther Christian University said it took him seven hours to reach Shillong from Guwahati airport. On Saturday many travellers including dignitaries from Meghalaya who were taking a flight from Guwahati missed their flights all because of the traffic jam. A senior police officer who visited the State recently said what Meghalaya needs to do immediately is to create a highway police unit to man the entire highway. He said some officers and about a hundred young cops trained in handling traffic management on the entire stretch of the highway should be immediately set up. He suggested that each officer would look after a certain stretch and there should be no bickering about jurisdiction. Farmers waiting by the roadside on the Umsning- Nongpoh- Umling stretch were exasperated that their vegetables were not going to reach the markets at Shillong or Guwahati. Everyone spoken to feels that trucks should not be allowed throughout the day and not all trucks can move as and when they want. Regulating them is imperative. Meanwhile Meghalaya DGP, N Ramchandran said the police would think of a long term strategy to address this problem. As of now, one truck turning turtle means a jam for everyone until the accident is cleared. Clearing accidents takes time because of shortage of cranes. Police personnel feel that the long trailers should be stopped at Nongpoh and not be allowed to come to Shillong. The on-going Shillong Autumn Festival being held at Orchid Lake at Ri-Bhoi on Saturday has further worsened the situation on the highway. Despite assurance by the Meghalaya Tourism Development Forum (MTDF) to tackle traffic-related problems, there was no let up in the traffic problem on Saturday. Several residents of Shillong who has planned to attend the Festival had to return from the halfway point. “We had to come back since we didn’t want to be left stranded in the highway for hours just to reach the destination,” was the general reaction of several people. A Minister, who was one of the victims of the traffic jam, said that the traffic congestion on Saturday was due to reckless driving. “A truck which broke down on one side of the road blocked about 50/60 vehicles on both sides of the road due to reckless driving,” said the Minister. He was scheduled to catch a flight for Kolkata at 12:40pm, but had to reschedule it to 3:20 pm. “I started from Shillong at 8:30am and reached Nongpoh only at 1pm,” said the Minister. He, however, said that the traffic congestion on Saturday has nothing to do with the ongoing Autumn Festival. “I personally feel that these drivers have to learn a lesson since there is 3/4 lines running in tandem on both sides of the highway. In such a situation it is not possible for the traffic personnel to manage anything,” he said. Many residents of the city said that the Autumn Festival should not have been held at the same venue year after year despite knowing the fact that the route from Umiam to Shillong is always congested and is a National Highway. “Why can’t they have this festival in Upper Shillong or Mawphlang leaving aside the highway,” questioned an irate resident who was stranded in the traffic for hours on Saturday. Additional Superintendent of Police (Traffic) Herbert Lyngdoh said that the traffic congestion was a result of a breakdown of a truck in Ri-Bhoi district. “We are trying our best to regulate the traffic and our flying squads and road parties are on the job,” he added.